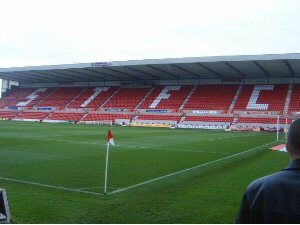 Having not been in over 12 years, I was delighted when Swindon were relegated to this division because it allowed for a visit to the County ground. It looked from other sources as if it was one of the better grounds in the division but the one thing I was worried about was the "Magic Roundabout", a seemingly difficult thing but luckily, I managed to avoid it all together. Getting to Swindon wasn't particulary difficult but it was boring as it was virtually all motorways and the lack of changing direction certainly left you to think of stuff to do on your journey. 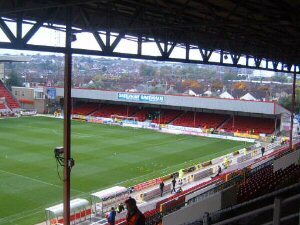 Once in Swindon, the ground is easily locateable and despite being a bit pricey, the car park at the ground was by far the best option for parking. 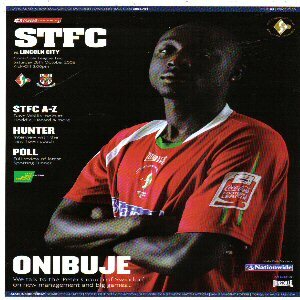 Around the ground, there is actually a far bit to do due to it being relatively close to the centre of Swindon and thankfully you're never too far from the ground. Getting inside the ground after climbing several flights of stairs proved a little annoying and the seats weren't easy on the back and it was like those seats you got at primary school. However, the view from the away end was good as you were in a corner of the side stand. It was a high stand and offered a great view of the action. 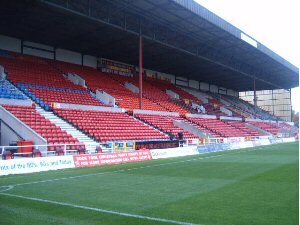 The stand opposite was the nicest at the ground and resembled City's CO-OP Stand, the far goal was a small, covered seat area before an uncovered large seating area behind the other goal. The atmosphere at the County Ground is good, with all 3 of the home ends chanting but there are a lot of idiots who sit near the away fans who spend most of the game watching the away fans rather than the ground. However, Swindon fans were virtually silent after the Imps took the lead and the game finished 1-0. Overall, the day out was good, relatively easy trip, lots to do and a nice ground once you get there and the only complaint I can make it the lack of comfort from the chairs. 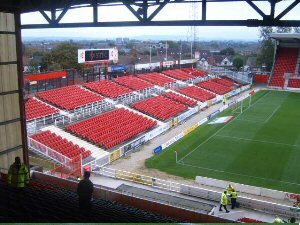 This ground is definately worthy of much higher standing in the league and is arguably the best in League 2 during recent years.